Quartz Countertops are getting popular day by due to attractive appearance and durability which brings luxury within affordability to your kitchen, bathroom and other places where you want to use countertops to give a stunning look to the room, i.e. a mini bar in your house, counters in your restaurant or any other commercial setting. Quartz countertops are available in many qualities and the best thing about them is that they do not have weaknesses like being unhygienic or vulnerable to scratches, so maintenance is fairly easy. Further the Quartz countertops do not need the extensive care; Quartz being harder manages to be durable. Quartz is a manufactured product and Quartz countertops are very attractive not only in the residential setting but also in commercial settings like café’s restaurants etc. Quartz countertops are available in a wider range of colors; you may not find these many colors in the natural stone, so whatever the kitchen theme you want, whichever colors you need your bathroom counter tops to be or you just want to give your commercial setting an innovative look, all is possible with Quartz countertops. If you’re looking to give your kitchen a luxurious look but still want to stay in the budget, the Quartz countertops are definitely the best choice. The finished look, delicate appearance, desired colors and the durability all makes it the best choice for your kitchen. Whether hygiene and cleanliness is your concern or you just cannot tolerate any kind of stains on the countertops, or else you are looking for a long term solutions, Quartz should be your number one choice. It is as hard as natural stone, i.e. granite and offers hygiene and cleanliness while stains can be sanded out easily with regular cleaning. Quartz easily stands up to juice, oil, wine, tomato, coffee and other main sources of stains in the kitchen and even in the bathrooms, so you are not just going to have a durable solution, but a hygienic one as well and that for years too. 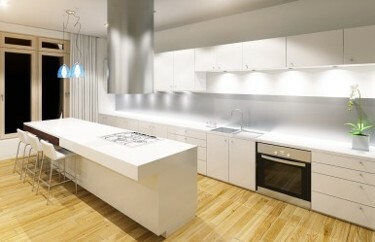 Quartz countertops come with all good things except the price which may look a bit higher to you. But keep in mind that the prices of Quartz are still competitive as compared to natural stone options, like granite, marble etc. Also, have in mind that investing in Quartz countertops means a long term solution, as durability is not less than that of other natural stones. Lastly, one thing about being cautious while using Quartz countertops; although they are heat resistant, but not as high as granite. Anything above F400 may damage the surface of Quartz countertop, so be very cautious while dealing with high level of heat. Similar goes for concrete and other such stuff that may damage the surface of Quartz countertops in your bathroom.